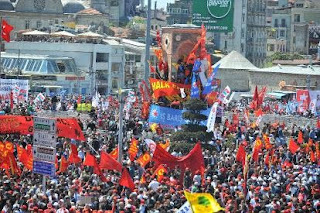 May Day celebrations took place in relative peace yesterday, the only disturbance coming when unhappy workers through stones and other objects at Turk-Is leader Mustafa Kumlu. From Hurriyet Daily News: More than 200,000 people gathered in Istanbul's Taksim Square for Saturday's May Day celebrations, which by midday were marred only by a protest of a union chief. Police deployed more than 22,000 officers for the rally, the first in Taksim Square since 1978. A group of workers protested the head of the Confederation of Turkish Labor Unions, or Türk İş, as he took the stage to make a speech on Saturday afternoon. Mustafa Kumlu was forced to leave the stage and seek shelter in the Atatürk Culture Center, or AKM, after workers from various organizations — Tekel, the former state alcohol and tobacco monopoly; İSKİ, the water and sewage directorate; and a fire brigade — began a protest. Some of the protesters threw stones, breaking some of the culture center's windows, Anatolia news agency reported. After the protest, the stage remained empty and the crowd began to disperse. The speeches restarted later.